Predicting server storage capacity is often difficult, forcing data professionals to scramble to address critical business interruptions because of insufficient disk storage. Most storage forecasting methods use simple trend forecasting, which is not accurate and will not prevent over-capacity incidents. Constantly changing workloads make planning for future storage needs difficult. The challenges in accurately predicting when systems will run out of storage space can have significant consequences for organizations, slowing data delivery or bringing business operations to a halt. Storage Forecasting in SentryOne 18.5 applies machine learning algorithms to forecast daily usage for all storage volumes across servers, enabling data professionals to proactively manage compute resources. The algorithms analyze workloads, fine-tune disk capacity forecasts, and provide intelligent reporting that can help prevent system downtime. Storage Forecasting produces daily usage forecasts for all logical disks, customizes a forecast for each volume, and analyzes previous forecasts on a daily basis. Over time, the system learns the unique workload of each volume and fine-tunes its forecasts accordingly. By default, the Windows Disk Forecast report shows all volumes in the monitored environment that are forecast to run out of space within 180 days. You can customize the report to generate forecasts for up to three years into the future. You can generate a report for all volumes on a particular server, and you can include a capacity planning forecast so that you can take measures to ensure you’ll meet your future storage needs. By clicking on a logical disk in the Disk Space tab, you’ll see a new chart that provides a history of available free disk space for the volume for the past 180 days. If a forecast is available, you’ll also get the next forecasted 180 days of consumption. The chart displays historical data and forecasted free disk space remaining with a prediction interval: The further into the future you predict, the wider the prediction interval. The chart also shows the forecasted Resource Exhaustion Date. 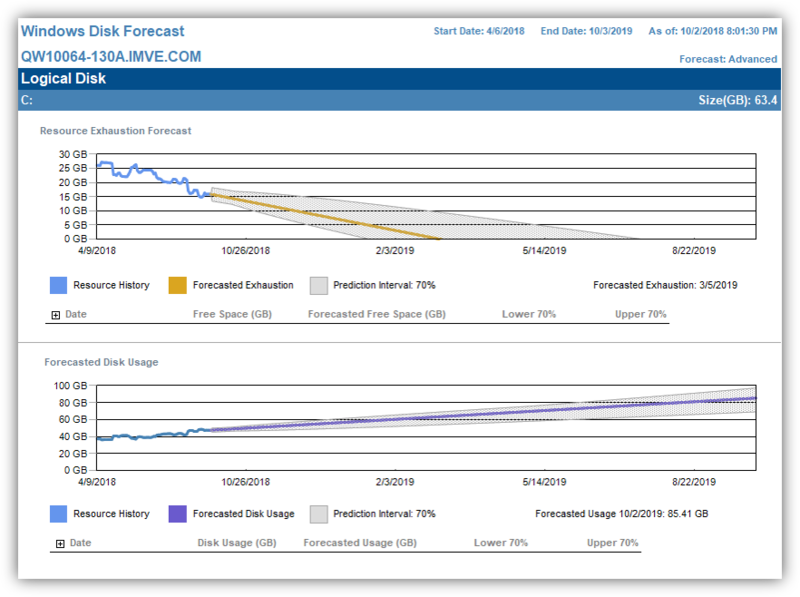 Beyond viewing daily reports of forecasted storage capacity, you can customize Advisory Conditions to receive alerts if any volumes are forecast to run out of space in the next 90 days, or if a forecasted exhaustion date changes by more than a month earlier than previously predicted. Knowing when the forecasted exhaustion date changes help you identify new database deployments or workload changes that could signal accelerated database growth. 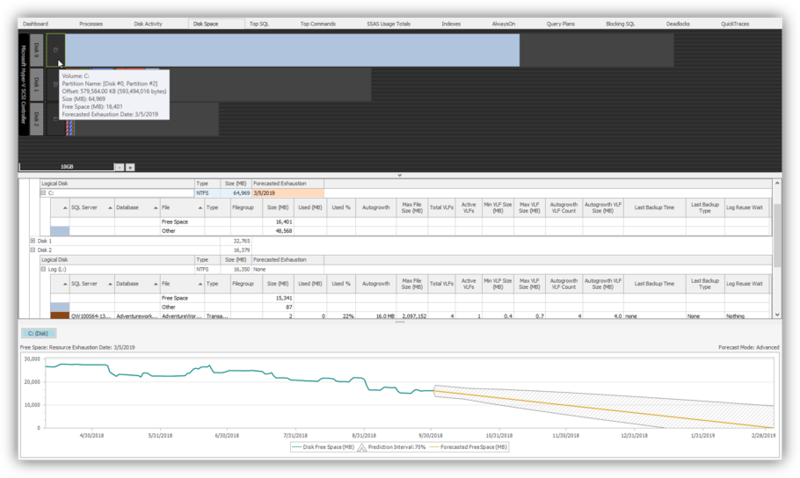 If you are using SentryOne Cloud Sync, you will get the advanced machine learning forecasts in the web-based cloud interface automatically. You’ll see the new Windows Disk Forecasting report, featuring the more advanced forecasts, available in your cloud account. From within your cloud account, you can set up a daily email with a report on any volumes predicted to run out of space. SentryOne Storage Forecasting applies machine learning to provide the most accurate predictions of future storage capacity available today. Data professionals and IT managers can now proactively address the problem of insufficient disk storage space to prevent business interruptions and keep database systems running at peak performance. Ready to Predict Your Future Storage Space?